DID YOU hear the news about the Aquino administration’s net satisfaction rating and retired Major General Jovito Palparan? Both have fallen. Public satisfaction with the administration hits a new all-time low: from +45 in March to +29 in June. A worried President Aquino called Budget Sec. Butch Abad and asked if he could consider resigning again. 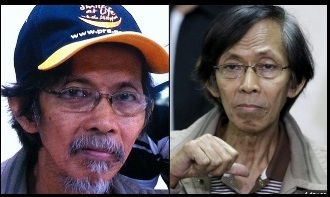 Jovito Palparan, the retired major general who was labeled as “The Butcher” by leftists has been arrested in Manila. The lone informant will receive a bounty of 2 million pesos. The NBI has submitted his name to the President, the DOJ and the BIR. Reports say the intelligence operation to capture retired Major General Jovito Palparan was codenamed Project Runway. When arresting agents came face to face with Palparan though, they changed the operation code to Ambush Makeover. An MRT train overshot the railway and slammed right into the metal barrier. Reports say at least 36 passengers got injured. President Aquino told CNN it’s fewer than that. Here’s what happened: Train 1 couldn’t advance to its destination. It was defective. Train 2 stepped in and tried to help push Train 1. The journey started smoothly. However, something wrong happened along the way resulting in Train 1’s crash. Just to be clear, this is a description of the MRT accident last Wednesday not the Noy-Mar tandem in 2010. For months, analysts have been saying that the MRT has serious problems and that certain officials are at fault. Now that an accident has happened, expect them to cover their tracks. After the near-disaster at the MRT that injured dozens of people, the official Twitter account of DOTC tweeted about a “technical problem” and apologized for the “inconvenience.” The tweet was even more disastrous. A wayward MRT train overshot the railway and crashed into the metal barrier. What a loco-motive! 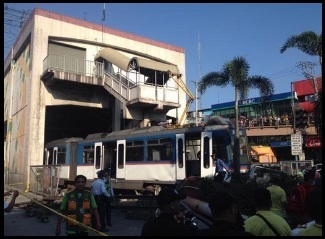 The driver of the derailed MRT train is now being investigated. Apparently, he’s still in shock. While being interviewed, he lost his train of thought. Reports say tycoon Manny Pangilinan is being considered by Vice President Binay as a potential running mate in 2016. Interesting. One is an intelligent, hardworking guy who has made billions from his empire and the other one is Manny Pangilinan. Sen. Antonio Trillanes wants Vice President Binay to face a Senate inquiry on the alleged overpriced car park building in Makati City. 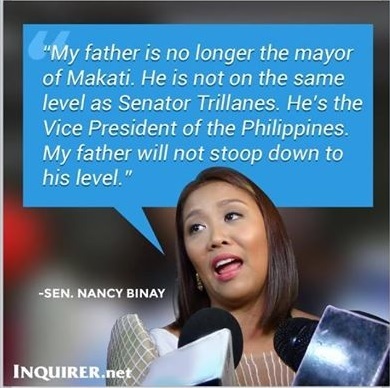 An upset Sen. Nancy Binay said, “Hindi n’ya ho ka-level si Senator Trillanes. My father will not stoop down to his level.” When sought for reaction, Trillanes refused to stoop down to Nancy’s level. The 8th National Nutrition Survey of the Food and Nutrition Research Institute showed 3 out of 10 Filipinos were overweight and obese. To those three, don’t be sad and don’t feel bad. Double chin up! 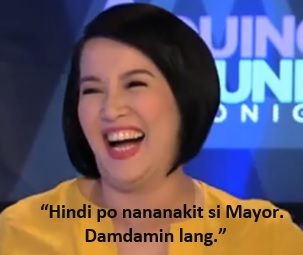 what ever reason the MRT3 Management will tell the riding public whenever there is something wrong with the trains or the system, nothing will happen until they buy the badly needed parts for their trains, their tracks and the whole system in general. The MRT3’s woes have become an almost daily occurence that not even the best and the brightest maintenance contractor can cure if they do not buy the needed parts!